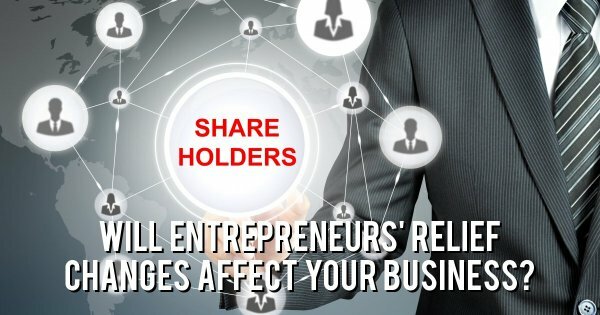 Will Entrepreneurs' Relief changes affect your business? In this article Chris Wallace reviews the recent Entrepreneurs' Relief (ER) changes and how it could affect your business. Entrepreneurs’ Relief (ER) is a significant tax relief available on the disposal of a business. ER gives access to a 10% rate of capital gains tax, subject to a lifetime limit of £10 million. ER is potentially available to company shareholders, owners of unincorporated businesses and trustees. For company shareholders, ER applies to gains on disposals of shares and securities in a ‘trading’ company or the holding company of a trading group. For owners of, or partners in, unincorporated trading businesses ER applies to gains on the disposal of a business or part of a business. It can also apply to disposals of assets after a business has ceased to trade. ER can also apply to assets (such as land and buildings) used by a company but owned by an individual or assets used by a partnership but owned by a partner. The assets disposed of need to be ‘associated’ with the withdrawal of the individual from participation in the company or partnership. For trustees, ER applies where there has been a disposal of trust assets which are ‘settlement business assets’ (shares and securities in a trading company or assets that have been used for the purpose of a trading business) and an individual is a ‘qualifying beneficiary’ (typically a life tenant). One of the changes announced in the Budget potentially affects company shareholders and trustees but other changes affect all the above groups. We summarise the changes below but consider what this may mean to you in the appendix (so that we can make it clearer how the changes affect you depending on your type of ownership or interest in a business). This change affects all business owners and shareholders. Ownership conditions apply generally throughout the period up to the date of disposal and, to access ER, the period of ownership is critical. The qualifying period was one year but Budget 2018 extends this to two years for disposals on or after 6 April 2019. For trustees who are company shareholders, the qualifying beneficiary of the trust, needs to be an individual who would have met the above tests if he had owned the shares. Please note that if your shareholding does not now qualify under the new distribution tests and your shareholding may not qualify under the new 5% proceeds test, that will mean your qualifying ownership period has come to an end and will not restart until the shareholdings are changed. If you are in any doubt about these changes, please do not hesitate to contact us. We can then discuss with you what action needs to be taken, if any, to ensure that ER will be available on a future disposal. It has always been judicious to take stock periodically of the maximum ER available were a company to be sold. The optimal answer is £10 million x the number of shareholders. The change to the percentage rules and the extension of the qualifying ownership period for disposals on or after 6 April 2019 reinforces the need to plan for a potential sale. For many shareholders, the new 5% rules should not require any changes to shareholdings as many companies will only have one class of share and thus each share ranks equally in respect of all the elements of rights required. the additional 5% tests may create an issue. It is important to consider such shareholdings now as the new tests already apply. If your shareholding does not now qualify under the new distribution tests and your shareholding may not qualify under the new 5% proceeds test, that will mean your qualifying ownership period has come to an end and will not restart until shareholdings are changed. Introducing spouses and civil partners to the business and shareholding potentially means they can claim ER separately – doubling the lifetime limit. But it’s critical they work for the company for the two year period. Conversely, if you meet the ER requirements as to the 5% rules and employee/office holder rules, it’s possible to add to your shareholding in the final two years, getting an additional benefit. Where shareholders are spouses or civil partners, last-minute planning has considerable potential. An unexpected offer is made for Crolles on the basis of a quick sale. As things stand, the husbands will qualify for ER on their shares, but the wives will not - they aren’t officers or employees and cannot be so for the two year qualifying period. Here however, Eva and Laetitia could consider transferring shares to their husbands, with the husbands making the disposal (intra-spouse transfers are on a no gain/no loss basis for CGT). This will only be of use up to a value of £10 million on each husband’s disposal. Bringing other family members into the company can also maximise ER - again paying regard to time limits, employment and share ownership rules. But note that share transfers between family members can have CGT consequences. It is possible to obtain ER where the company ceases to trade such as when you want to retire and withdraw accumulated funds from the company. If the company is liquidated, distributions to you in a liquidation may qualify for ER. The distributions are treated as part disposals of the shares and, although the company is not trading, ER will still be available if the distributions take place within three years of that cessation. All 5% and officer/employee conditions must be met in the two years leading up to cessation. The period remains one year if the company ceased trading before 29 October 2018.
there are no arrangements (excluding the material disposal itself) under which you (or a connected person) are entitled to acquire shares or securities in that company, or a company which is a member of the same trading group. There are a number of other conditions, one of which is the requirement for the asset to be in use in the business throughout a period of time ending with the earlier of the date of the material disposal of business assets, or cessation of the business of the company. The period of time is extended from one to two years for asset disposals on or after 6 April 2019. The period remains one year if the company ceased trading before 29 October 2018. If you started your business before April 2017, the new two year rule will not impact on your entitlement to ER for disposals on or after 6 April 2019 as you will have already accumulated the necessary two year ownership period. The new rules will however have an impact if you are considering creating a partnership. Introducing spouses, civil partners or other family members to the business potentially means they can claim ER separately. But it’s critical they are partners for two years. It is possible to obtain ER if you cease to trade such as when you want to retire from the business. ER will be available against gains arising on the disposal of assets used in the business within three years of that cessation. The necessary two year condition applies to the period of time leading up to the date of cessation. The period remains one year if the business ceased trading before 29 October 2018. ER is available if you make a gain on disposing of your share in the partnership, for example if you retire. If you have been a partner in the business before April 2017, the new two year rule will not impact on your entitlement to ER for disposals on or after 6 April 2019 as you will have already accumulated the necessary two year ownership period. ER is also available if the partnership ceases to trade. ER will be available against gains arising on the disposal of assets used in the business within three years of that cessation. The necessary two year condition applies to the period of time leading up to the date of cessation. The period remains one year if the partnership ceased trading before 29 October 2018. ER may also be available on ‘associated’ disposals ie the disposal of an asset held outside the partnership by a partner. The disposal needs to be associated with a ‘relevant material disposal’. A material disposal means you dispose of at least a 5% interest in the assets of a partnership (or, in some situations, if your partnership interest is less than 5%, all of that interest), and there are no arrangements (excluding the material disposal itself) under which you (or a connected person) are entitled to acquire an interest in that partnership. There are a number of other conditions, one of which is the requirement for the asset to be in use in the business throughout a period of time ending with the earlier of the date of the material disposal of business assets, or cessation of the business. The period of time is extended from one to two years for asset disposals on or after 6 April 2019. The period remains one year if the partnership ceased trading before 29 October 2018.
determine whether the beneficiary would have qualified for ER throughout a period of two years ending within the three years up to the date of the actual disposal of the shares by the trustees. So the beneficiary needs to satisfy the 5% rules for the two year period. For many trustees, the new 5% rules should not require any changes to shareholdings as many companies will only have one class of share and thus each share ranks equally in respect of all the elements of rights required. If your shareholding does not now qualify under the new distribution tests and your shareholding may not qualify under the new 5% proceeds test, that may mean your qualifying ownership period has come to an end and will not restart until shareholdings are changed. If you think your business may be affected by the Entrepreneurs' Relief changes please contact Chris Wallace on 01727 730550 or email enquiries@visionaryaccountants.co.uk.